Crystals of Pyrohroite usually plate tablet lamellar or expressly rhombohedral. Fissile and lamellar tabular or dense grainy the masses are more widespread. A mineral of colourless or dark blue-green is in the fresh state. On air he is exposed to oxidization and meat-red becomes or violet and, finally, brown-black, passing to different oxides of trivalent manganese. Cleavage perfect absolute parallell to bottom base, brilliance of mother-of-pear nacreous on the surfaces of cleavage, when mineral fresh. At general visual examination of Pyrohroite hardness to recognize. About his presence it is possible to guess on plenty of the accompanying second oxides of manganese (in particular case powdery) and on the type of mine deposit. 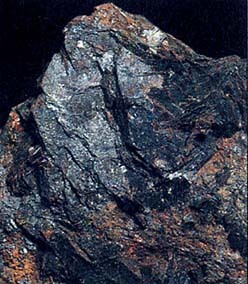 It is in some ore deposits of complex type, where he appears, at least, partly, due to oxidization of mangazotite. Found out the most known locations in Sweden, in Langbane. Pyrohroite there associated with rare arsenate and native lead. In the United States of America he is found in a deposit mine Franclin (the state is New Jersey). The noticeable amounts of Pyrohroite are met in Japan, in different mineries.